Features: Growden Report: Ostriches at Australia's top table? A few hundred metres away from the Wallabies' team base are the imposing walls of Cardiff Castle; Wallabies coach Michael Cheika has been peering intently at the castle from his hotel window the past few days, wondering if he can use those same walls to provide his team with some tough love before this weekend's Test against Wales. Maybe force the players to clamber over the walls with their bare hands. Even try to tunnel underneath a la Dickie Attenborough and co in The Great Escape. After all, Cheika is accustomed to bursting his way through fortresses, as well as using man-made obstacles to dramatically improve team culture. If you want to see a grown Waratahs player immediately collapse in a lather of cry-baby tears, just mention a certain set of stairs in the coastal Sydney suburb of Coogee. For weeks on end before this year's Super Rugby tournament, Cheika, in a bid to at last get the Waratahs fit, used those stairs as a form of torture chamber. Up and down, up and down, they went until they were a disheveled mess. It worked. After being a bunch of dozing layabouts for far too long, Cheika transformed the Waratahs contingent into the best finishers in southern hemisphere provincial rugby. And, voila, the Waratahs went on to hoist the Super Rugby trophy for the first time. New South Wales Rugby has numerous crucial unwieldy fortifications still to counter, including the Australian Rugby Union - which has this week infuriated Sydney's Premier Rugby teams by indicating that club funding is about to be cut to absolute zero - but Cheika has at least succeeded where many others have failed. The coach transformed the Waratahs from fat pussycats into fearless powerbrokers, and he will now attempt to do the same at Wallabies level. The early signs are encouraging. 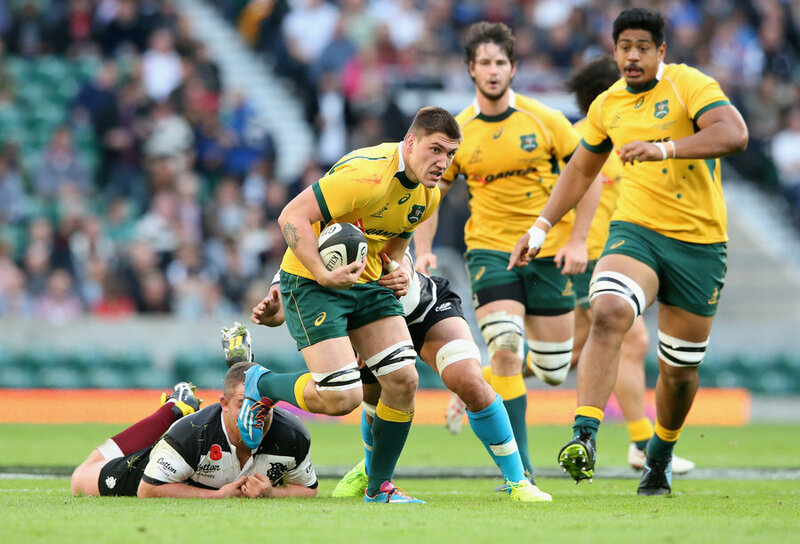 Several players have noted already that aggressive Waratahs tactics have drifted into the Wallabies'playbook. The signs were there on show from the kick-off against the Barbarians at Twickenham. Instead of the usual brown's-cows formation in which the players amble off in all directions in search of a loose bale of hay, the Wallabies lined up in formation on the 10m line and charged as one. Just as the Waratahs had done all season. There was at last some purpose to what the Wallabies were up to. As Cheika explained later: "It's symbolic, we're prepared to run 10 metres to gain 20 centimetres at the other end if that's what it takes." But there were also obvious signals in the previous Test that considerable changes to the team's mentality and approach were afoot. Ewen McKenzie was still there as Wallabies coach for the final Bledisloe Cup Test of the year against the All Blacks in Brisbane, but the players had lost faith with the hierarchy due to the kerfuffle involving former team business manager Di Patston. McKenzie had resigned that morning, but he didn't tell the players until after the game. It didn't matter because the Wallabies players that night weren't playing for McKenzie or for the multitude of Australian Rugby Union jersey-tuggers. They were playing for themselves, for their own pride, to make Adam Ashley-Cooper's 100th Test a special occasion, cobbling together a fast and aggressive game plan that incorporated so much of the Waratahs playbook with some intricate Brumbies tactics mixed in. Thankfully they opted against the Brumbies' relentlessly boring box kicking, keeping ball in hand and being so aggressive at the breakdown, until Nic White came on in the second half and fell into his old habit of wasting territory with an unnecessary balloon kick up field. A stern talking to was required. Until then, it was sparkling stuff. Now Cheika has to mould all this into something even more threatening. He hasn't had much time. But he is using that time wisely. As importantly Cheika is relishing the off-field banter. Robbie Deans shied away from it. McKenzie was always a bit forced and was often made to look silly when his All Blacks counterpart Steve Hansen had a dig at him, as shown by some dopey comments made before the Auckland Test massacre this year. Cheika, the most street-wise Wallabies coach since Eddie Jones, laughed when asked this week how he was going to prepare for the strategic battle with the wily Wales and British & Irish Lions coach Warren Gatland. ''Mate, I'm not playing, there's no coach tackling coach in the corridor,'' Cheika said. "I am the new kid on the block, I am concentrating on getting our piece right." 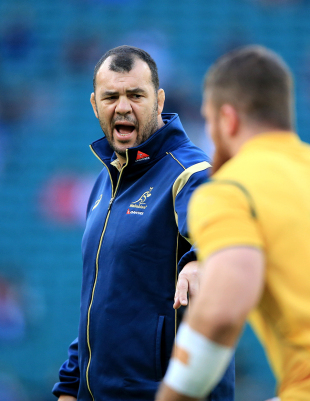 Cheika, with that comment, continues to confirm the Wallabies' bull-dust era is at last over. Instead, much needed belligerence created by the players, and not caused by some obstructive team official, has returned to Wallabyland. Pity about the Sydney club funding fiasco, though. Maybe the clubs need Cheika to rally the troops to ensure the foundations of the game are not ruined by general incompetence at the top level.